It’s easy to understand why state officials like Governor Perry, border state residents, law enforcement officers, and other public officials are frustrated with the federal government. Border state residents deal with border issues on a daily basis, whereas most policymakers in Washington, DC, only see those problems on paper. They’re not the ones whose fences are being destroyed so drug traffickers can trespass on their land. They’re not the ones counting illegal immigrants passing through their front yards by the hundreds in a typical week. They’re also not the ones seeing their hard-earned city, county, and state tax dollars being spent on programs that benefit people who knowingly broke the rules. Texas is one of the two epicenters for these frustrations. Americans and foreigners alike picture the Lone Star state as a collection of iconic images: cowboy hats and boots, horses and cattle, and lots of wide open spaces where ranchers and farmers tend to their land and animals with pride. Many ranches and farms in Texas were established shortly after the Civil War, and their ownership has been passed down from generation to generation. Being a Texas rancher or farmer is a way of life, with deep roots in the region’s history. Most of the state’s border land is privately held in the form of ranches and farms. These homesteads have been in operation for decades, so their owners have pretty much seen it all. When Texas Agriculture Commissioner Todd Staples–whom you read about in Chapter 3–took office in 2006, he was mildly aware of the security situation in Mexico and along the border. But then he started getting some disturbing phone calls from his constituents. These ranchers and farmers living on the border pleaded with Staples to be their unified voice at the state, and possibly national, level. So in March 2011, the Texas Department of Agriculture created a website called ProtectYourTexasBorder.com. A few months later, department staff conducted video interviews with various Texas landowners, law enforcement officers, and public officials, who spoke about their personal experiences with the dangers of living and working so close to the border. From these videos, a sixteen-part series was created, and the videos were posted on the site, one at a time, over the course of a few months. Adding fuel to the fire was a study commissioned by the Texas Department of Agriculture that provided a military perspective of the border security problem in Texas. The 182-page report, titled Texas Border Security: A Strategic Military Assessment, released in September 2011, was written by retired four-star Army general Barry McCaffrey, former director of the Office of National Drug Control Policy under President Bill Clinton, and retired Army major general Robert Scales, former commandant of the United States Army War College. The authorship is evident in the report’s language. In several places, the report characterized the Texas-Mexico border as a war zone, which led some journalists to say that Staples had indeed declared war on the border and was irrationally pushing to militarize border security efforts. Despite the criticism, the Protect Your Texas Border website has stayed up and continues to draw a regular amount of Internet traffic. The Scales/McCaffrey report has been repeatedly cheered and jeered by politicians on both sides of the aisle, but that still serves a purpose: drawing attention to the plight of Texas residents–namely ranchers and farmers–living close to the border. But their role in the state’s border security plan didn’t end with the videos or the study. In January 2012, the Texas Rangers–part of the Texas Department of Public Safety (DPS) came up with a plan called Operation Drawbridge, through which they partnered up with the Texas and Southwestern Cattle Raisers Association to place cameras on the properties of participating ranchers. The cameras are inexpensive (about $300 apiece), but have the capability to operate in low light and activate via motion sensors. When movement is detected–specifically, the movement of drug smugglers or illegal immigrants–alerts are sent to the Border Patrol, the sheriff’s office, the state Fusion Center (a joint interagency unit), and other border law enforcement agencies. The system that sends the alerts was created in-house by DPS information technology staff. The initial results of Operation Drawbridge were promising. The early testing phase consisted of the placement of only twenty cameras on Texas ranchland, but they led to over three hundred arrests of both immigrants and smugglers. The program expanded to three hundred cameras, and by June 2012 they resulted in over two thousand arrests and the seizure of more than five tons of illegal drugs, according to DPS. Seeing the operation’s success, in October 2012 the Texas Department of Agriculture awarded a $225,000 grant to DPS to extend it even further. By the time of the grant award, the number of arrests and seizure tonnage had doubled from just four months earlier. Operation Drawbridge cameras aren’t the only camera systems on private property along the border. Another system is run by the private company BlueServo, which created a network of cameras along the Texas-Mexico border that streams a live feed to their website. People can sign up to monitor the feeds as “Virtual Texas Deputies” and report any sightings of illegal immigrants or drug smugglers to authorities via email only. 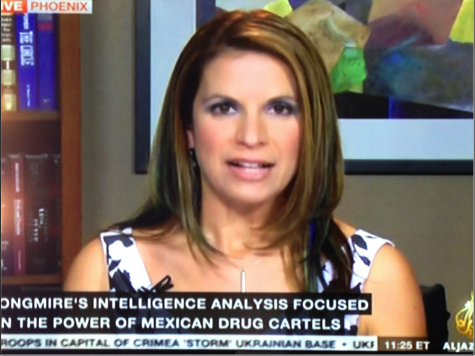 BlueServo calls it the Virtual Community Watch and describes it as “an innovative real-time surveillance program designed to empower the public to proactively participate in fighting border crime.” The BlueServo system began as a private endeavor in cooperation with the Texas Border Sheriff’s Coalition, but management of the program shifted to Texas DPS in September 2011. It’s easy to see BlueServo’s appeal to Texas residents who are angry with the federal government for not doing what they perceive as enough to stop cross-border traffic. According to the website, the system “will allow the public to directly participate in reducing crime and improving their communities.” BlueServo also makes the feel-good assertion, “This service will provide millions of dollars in benefits to local border Sheriffs.” Adding to the feeling of active participation is the ability for individuals to connect their own cameras on their property to the Watch system. You can read more about the way border residents are taking matters into their own hands, as well as Washington’s inability to define what a secure border looks like in order to develop a comprehensive border security strategy, in Sylvia Longmire’s book Border Insecurity. You can learn more about the book, watch the official trailer, and read reviews at the official website, www.BorderInsecurity.com.